What’s the make-up of a native bee hive? Some of you may not have seen inside your native beehive. 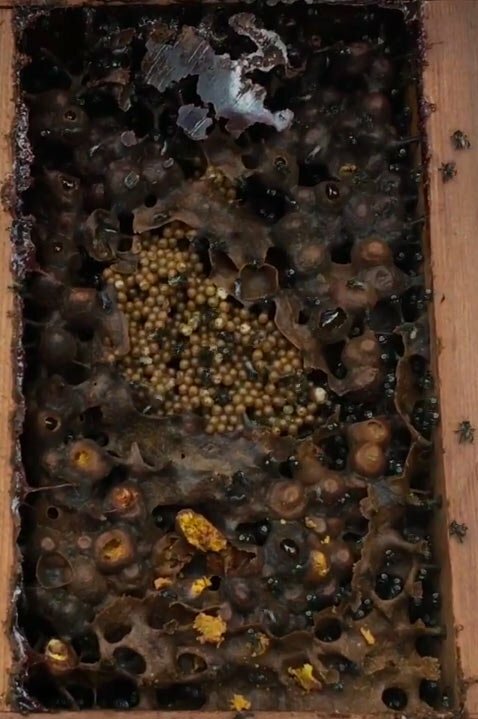 In this video I will take a quick look inside a hive. 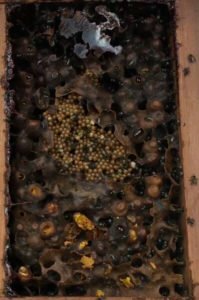 Each stingless bee colony will build in their own way. Some will have large brood structure, some small. Entrance tunnels may be short or long. One colony may collect a lot of Cadagi resin/seeds while one next to it may not. Each hive has its own set of jobs it will want to focus on and this is why they are different inside each box. They all will, however, contain the above components if they are healthy. Something interesting about the propolis cerumen and resins in a native beehive is they slightly differ from each other in the way the bees mix them up. A few examples of different types for different jobs are as follows. This is the name we use for the wax produced by native bees. I have seen nurse bees produce it as small tiny scales that are clear like glass. Often these can bee seen at night with the use of a very bright led torch on the sides and back of the abdomen. This can be found surrounding the brood structure especially during winter. It is a soft like wax in texture and often in layers. It contains the smell of the queen and will gain interest if added to another hive. This is a very soft high cerumen content propolis. It needs to be so air does not get to the honey or pollen and cause it to ferment. It can be washed clean and stays malleable. Highly prized by native bees because it can be easily reused by them. This propolis has less cerumen content than that of honey pot cerumen or involucrum propolis. It contains more plant resin than most and if left alone it hardens very hard and becomes brittle. Interesting fact: If your beehive falls on its side the bees will reorient the whole hive and work in a different direction. Brood will change 90 degrees and honey and pollen pots will also change so the bees can fill them up without honey falling out. Pretty cool huh?